Fish baskets can make grilling fish and plenty of other smaller foods easier than you ever thought possible. In this article we have reviewed several of the best and most popular fish baskets for grilling on the market today and highlighted the benefits and drawbacks associated with each product. 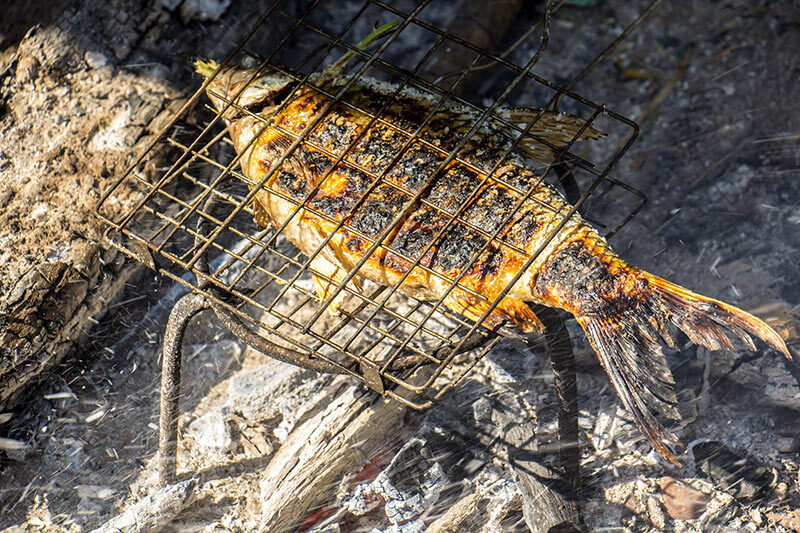 We have also included a Fish Basket Buying Guide, in which we will point out the various features, factors and characteristics you should consider when shopping for one of these great grilling items. Why Use a Fish Grill Basket? Which Type of Fish Grill Basket Is Right for You? If you’ve decided a fish basket could make your life easier, there are some important things you should know before you make your purchase—some factors and features you should consider before spending your hard-earned money. Here we have outlined just a few of those considerations. If you like to BBQ—and you like fish—a fish grill basket is a must. Trying to cook fish directly on most grills can be a very frustrating experience. In fact, unless you are cooking a very hearty fish variety, such as salmon, swordfish and shark, grilling fish on a standard grill surface is darn near impossible. With a fish grill basket you can cook any type of fish you enjoy without having to worry about the fish falling apart and falling through the grate as you cook. In addition, a fish grill basket allows you to create grill marks and char your fish just like the professional chefs, without losing the charred surface every time you flip it. In addition to being a Godsend for fish, a fish grill basket is also ideal when you want to cook delicate items like vegetables, fruit, breads and other types of seafood. There are essentially two type of fish grilling baskets: open-faced baskets and closed-faced baskets. Open-faced baskets, which look like any other type of shallow basket you can think of only with smaller holes, can be used for fish, but they are actually better for cooking things like corn, hot dogs, shrimp, clams and other foods that you think might fall through—or roll off—the grill. Closed-faced baskets, on the other hand, are specifically designed for fish. Closed-face fish baskets feature two pieces that are bound together with a sturdy hinge. When the top of the fish basket comes down, there is a locking mechanism to hold it in place. This allows you to cook both sides of the fish by turning only the basket and not the fish itself. Fish baskets come in a variety of convenient sizes and styles. Some of the larger fish baskets allow you to cook a number of fish at once, along with extras like fruits and vegetables at the same time. Other fish baskets are so small that they only accommodate one or two fish at a time, making them perfect for things like camping, but not quite as ideal for large get-togethers. One of the biggest drawbacks associated with many fish baskets on the market is that they are an absolute bear to clean. Given their small grate size, it can often be difficult to extract food particles once they stick between these grates, causing you to spend more time on the cleanup than the actual cooking. For this reason, we recommend you select a fish grilling basket that is completely dishwasher safe. Finally, it is always important to check out a fish basket’s flexibility. Some baskets are made with rigid, heavy-duty steel that prevents them from flexing, and while this is okay for merely cooking fish, it makes it quite difficult for those baskets to accommodate thicker foods like corn. Your best bet is to choose one that will flex to fit, giving you the versatility you need to cook a variety of food types in your new basket. With its more than ample grilling surface, the Cuisinart CNTB-422 Simply Grilling Nonstick Grilling Basket is the perfect tool for cooking an abundance of fish, seafood and other delicate foods that might otherwise need to be cooked in a different way. With this fish basket, you can literally lock in the food you cook and thus prevent it from falling through the grate of your grill. Its elongated heat-resistant handle allows for easy and hassle-free turning; and because both the grill and handle are fully adjustable they can accommodate a wide variety of foods, regardless of thickness. The Cuisinart CNTB-422 Simply Grilling Nonstick Grilling Basket features a commercial grade non-stick coating that ensures fast and easy food release and simple cleaning. The dimensions of the basket, excluding the handle, measure 9 inches by 11.5 inches by 1.75 inches, offering plenty of depth and surface area for any grilling endeavor. In addition to being able to handle all types of fish and seafood, the basket is also perfect for grilling vegetables and other fine foods, and can even take the place of kabobs. Large. The Cuisinart CNTB-422 Simply Grilling Nonstick Grilling Basket has a very large surface area for grilling, much larger than the other baskets on our list. Versatile. In addition to fish, the basket can assist grill enthusiasts in the cooking of meats, vegetables and other delicate food items. Adjustable. The adjustable thickness on the fish basket allows it to handle food of various thicknesses, even hot dogs and corn on the cob, which are notoriously famous for rolling off the grill. Hand Wash Only. Due to the non-stick coating on the Cuisinart CNTB-422 Simply Grilling Nonstick Grilling Basket, it cannot be placed in the dishwasher, which may add to your cleanup time. The Outset QC73 Flex Grill Basket with Rosewood Handle is made from only the best heavy gauge chromed steel, a material which conducts heat very slowly to minimize burns on your fish and other delicate foods as they grill. The convenient locking mechanism on this fish grilling basket opens and closes easily, and once locked into place users can turn the basket at will without having to worry about the basket opening. The oversized nature of the Outset QC73 Flex Grill Basket with Rosewood Handle allows it to expand to accommodate thicker foods, and the grates are so small that even chopped vegetables can be cooked directly on the BBQ. The basket molds effortlessly to food to keep it in place; and the rosewood handle gives the basket a rustic look that looks great in any kitchen or outdoor island. With the Outset QC73 Flex Grill Basket with Rosewood Handle you can grill the thickest and thinnest of foods without worry, thanks to the almost elastic one-of-a-kind and oversized manufacturer’s design. Although super durable, the heavy-gauge chrome used to make this fish basket is also fairly flexible, adapting to the different types of fish, seafood and delicate foods that occupy it. The basket is the perfect solution for grilling fish, pork chops, delicate fillets, corn, and other fragile veggies and fruits; and it represents a convenient way to char all of your hamburger and hot dog buns at once. Secure. Thanks to its intuitive locking mechanism, the Outset QC73 Flex Grill Basket is very secure. Thin grates. The thin grates on this fish grilling basket allow it to handle very small food items, including chopped fruits and vegetables. Flexible. As the name suggests, the Outset QC73 Flex Grill Basket with Rosewood Handle can adapt to thicker foods like corn on the cob and pork chops. Handle can get hot. According to some users, the rosewood handle on the Outset QC73 Flex Grill Basket can get very hot during the cooking process. Can be difficult to clean. Due to the smaller grates, this fish and grilling basket can be hard to clean. Built to resist rust and corrosion, the Weber 6471 Original Stainless Steel Fish Basket is the perfect outdoor grilling tool and makes a great gift for the BBQ enthusiast in the family. Designed to fit on the Weber Q 300 and larger gas grills; as well as the 18.5 inch Weber charcoal grill, the fish basket boasts a flexible wire design that allows it to expand and house a wide abundance of food types. The Weber 6471 Original Stainless Steel Fish Basket is idyllic for cooking fish of all sizes, including large whole fish, and delicate foods such as fruits, vegetables, nuts and breads. Its unique design enables it to elevate the food from the grates, which reduces the chance of anything sticking to the fine wire. Grillers can use the Weber Fish Basket to prepare sliced food items as well as smaller pieces of meats; and its simple construction will allow them to flip multiple food items at one time without worry, ensuring nothing stays on the grill for too long. The Weber 6471 Original Stainless Steel Fish Basket is completely dishwasher safe and can be found at most retail outlets in which cookware is sold. Elevates food from the grate. Tired of having your charred fish become un-charred after you flip it? If so, the Weber 6471 Original Stainless Steel Fish Basket, which elevates food from the grate, will ensure that never happens again. Dishwasher safe. Unlike many fish grilling baskets, the Weber model is 100 percent dishwasher safe. Easy Flip. The basket’s flexible wire and secure locking mechanism makes it very effortless to flip multiple food items at one time to prevent burning. Made primarily for Weber Grills. Although the Weber 6471 Original Stainless Steel Fish Basket may work with some other grills, it is made to be used specifically on Weber grilling products. Not ideal for smaller grills. The large fish basket is not designed to be used on smaller grills.